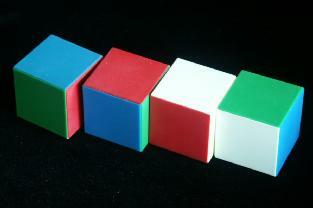 'Instant Insanity' consists of four separate cubes. Each side of a cube has a single colour. There are four colours. The aim of the puzzle is to put the cubes on top of one another in a tower such that each side is a mix of all four colours. The colours of the other faces (hidden inside the tower or top/bottom) do not matter. It is often incorrectly thought that each side of the tower should have only one colour. This is impossible on all versions I have seen. 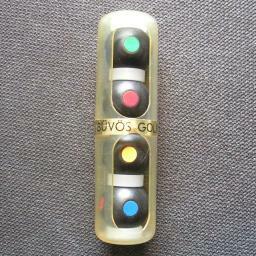 The second picture shows a Hungarian version (Buvos Golyok) which uses a frame containing balls with spots on them instead of separate cubes. The puzzle became popular in the 1960's when it was produced by Parker Brothers, but it is actually much older. It was first made around 1900 and was then called 'The Great Tantalizer'. More recently it has also been sold as Cube-4, or Trikki 4. As far as I know, most four cube versions of the puzzle that have been produced are essentially the same. They nearly all have the following cubes, though possibly with slightly different colours (for example white instead of yellow, or the yellow, green and blue colours swapped around), or some of the pieces in mirror image. This standard version has a unique solution. James East told me about a version called "Watch It!" which has clocks on the sides of the cubes instead of colours. Instead of red faces it has clocks showing 2 o'clock, yellow becomes 4 o'clock, green is 8 o'clock, and blue is 10 o'clock. The aim of this puzzle is for the sides to add up to 24 hours. This can be solved by having each side show all different clocks, since 10+8+4+2=24. It does however have ten more solutions, since the 24 can also be reached by 10+10+2+2 or 8+8+4+4. This leaves only 244/8 = 41,472 distinct positions. Similarly six cubes have 246/8 = 23,887,872 positions. Kadon Enterprises Inc. has reissued the puzzle. Mefferts sells the 6 cube version Drive Ya Crazy. Here is the unique solution to the standard version described above. As mentioned earlier, the cubes can be in any order. The cube with three red faces is easiest to recognize, so start with that one. The other cubes can also be recognised by the colours which occur more than once. There is a neat method for solving this puzzle. 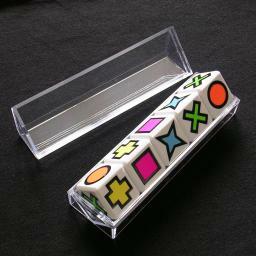 It shows whether there is no other solution, and works for any version of the puzzle. Number the cubes. I will use the numbering shown at the top of the page. You will next build a graph. Draw four points, arranged in a square which will represent the four colours. Take the first cube. There are three pairs of opposite faces. For each pair, draw a line between the points of those two colours, and mark it with the number 1 to show it comes from the first cube. Note that if two opposite faces have the same colour, then you will draw a loop from the point of that colour back to itself. Repeat this for the other three cubes, but now marking the lines with the appropriate numbers 2,3 and 4. Now find two loops in this graph, such that each loop visits all four colours once, and uses lines with each number once. The two loops may not use the same lines. One loop will solve the front and back, the other the right and left sides. Take cube 1, and see where it occurs in the loops. 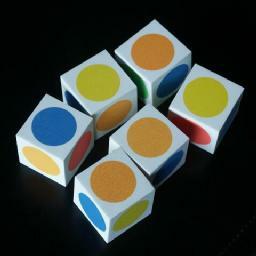 Cube 1 connects R-G and Y-B, so place the cube with Red at the front (Green at the back) and Yellow on the right (Blue on the left). Do exactly the same for the other cubes, and you will then have a solution when they are stacked together. This solution is unique up to reordering the cubes or turning over the stack of cubes. R - 3 - R, B - 2 - G - 4 - Y - 1 - B. Again this solution is essentially unique, though most cubes have two orientations that show the same colour. This puzzle is actually much easier than the standard instant insanity. Note that there are actually two solutions. The top can be yellow, the bottom green or vice versa. Any two of these sets gives a solution. Note that you may reverse the direction of one or more of the loops and this may result in a slightly different solution. An interesting feature of this puzzle is that if you have a solution (such as the one shown at the beginning of this section) then it does not matter which direction you stack the cubes in, i.e. you can put them in a row on top of, next to, or behind each other, giving a solution each way. These three solutions correspond to the three ways of choosing two of the three sets of loops above. If you choose the two pairs of short loops for the four sides then the long loop is used in the internal cube faces, and this allows the cubes to be reordered such that touching faces have the same colour. There are essentially three solutions, constructed as before by using any two of these loops to determine the two pairs of opposing sides. Unlike the Drive Ya Crazy, it is not possible to use the third loop to make the touching faces the same because some cubes would need to be turned over to get the matching faces together. This also means that to go from one solution to the other you must not only just stack them in a different direction but also turn around two cubes (cubes 2 and 5 to be exact).